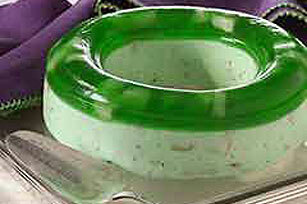 This pretty lime gelatin mold has two layers. Both are studded with pears and one is made with cream cheese and pecans. Serve as a salad or dessert. Drain pears, reserving liquid. Add enough water to liquid to measure 1-1/2 cups; bring to boil in small saucepan. Chop pears; set aside. Stir boiling liquid into gelatin in large bowl at least 2 minutes until completely dissolved. Stir in cold ginger ale and lemon juice. Pour 1 cup of the gelatin into 5-cup mold. Refrigerate about 30 minutes or until slightly thickened (spoon drawn through leaves definite impression). Arrange some of the pears in mold, pushing into gelatin in mold. Meanwhile, gradually add remaining gelatin to cream cheese in large bowl, mixing with wire whisk until well blended. Refrigerate about 30 minutes or until slightly thickened (consistency of unbeaten egg whites). Stir in remaining pears and pecans. Spoon over gelatin layer in mold. Dip mold in warm water for about 15 seconds. Gently pull gelatin from around edges with moist fingers. Place moistened serving plate on top of mold. Invert mold and plate. Holding mold and plate together, shake slightly to loosen. Gently remove mold and center gelatin on plate. Substitute water for ginger ale.